Definition: As the name suggests, ‘sole’ means ‘only one’ and ‘proprietorship’ implies ‘ownership’. Hence, a sole proprietorship is a form of business organisation, wherein a single person owns, manages and controls, all the business activities and the individual who operates the business is called as a sole proprietor or, a sole trader. In this business unit, the sole proprietor is exclusively responsible for employing capital to commence business, bearing all the risk of the enterprise and also for managing all the activities single-handedly. And to do so, he/she pools and arranges various resources in an organised way, with the sole aim of earning profit. The owner is exclusively responsible for all the decisions. All the profits earned by the business goes to sole trader’s pocket, and he is solely responsible for the loss suffered. 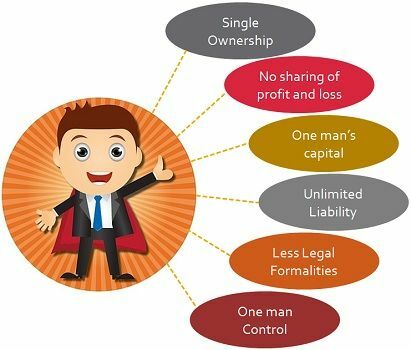 Single Ownership: It is a type of business unit, in which a single person owns the entire business, i.e. all the assets and property belongs to the proprietor. Accordingly, he bears all the risk associated with the enterprise. Hence, the business ends up at his will or on his demise. No sharing of Profit and Loss: Whatever income generated from the sole proprietorship business, it belongs to the sole proprietor only. Consequently, he alone bears all the losses incurred by the firm. There is no sharing of the business profits and losses. One man’s capital: The capital required to start the business or to continue operations, is arranged and brought to the business by the sole proprietor only, either from his personal resources or by borrowing, i.e. from the bank, financial institutions, friends, relatives, etc. Unlimited Liability: This is one of the major con of sole proprietorship business, i.e. the liabilities are unlimited. In the event of loss, the personal assets of the proprietor along with the business assets can be utilised to discharge the dues of business. Less Legal Formalities: The legal requirements for formation, operation and closure of a sole tradership business is almost nil, even it does not need registration. Although for the purpose of business, it can be registered with local self-government, and obtain a certificate of registration. One man Control: As only one person is in charge of all the activities, he has full fledged control over it. Thus, the sole proprietor takes all the decision and execute it, in the manner he wants. There is no legal distinction between the proprietor and business; they are one and the same thing in the eyes of the law. Sole proprietor uses his own skills, intelligence and expertise to operate the business. A sole proprietorship is among the oldest and simplest business forms wherein, only one man heads the entire show. Some common examples of sole proprietorship business are grocery shop, chemist shops, beauty parlours, fabrication units and so on. In spite of various shortcomings, many businesspersons choose sole proprietorship business, especially startup founders, due to its inherent benefits. Such business is appropriate where the market for the product is limited or when the customers demand personalised services. It also suits to the businesses where manual skills are required or where the capital required to start the business is relatively small and does not involve a high degree of risk.